Partition walls and room dividers can bring a big change to your rooms. They are part of interior designing which plays an important role in decoration. Partition walls or room divider can be called as screens or piece of furniture that divides a room into two or more separate areas. Using partition walls and room dividers also helps in saving and utilizing space in creative manner. Using Ides of Bookcase partition would be a wonderful addition to your room. It will give a classic, simple and creative look to a room. Use a bookcase divider shelf that stores books and divides the area space at the same time. You can use a simple bookcase as well as stylish varieties, there's a wide verity of simple and stylish bookcases available in the market .Most of the people feels like rooms looks smaller after putting partitions or dividers. Putting others items like Indoor plants on bookshelves will give a spacious, vibrant and fresh look to the room. If you don’t want to think much and you don't mind hiring extra labour then the easiest way is just building a wall to separate room areas. Just building a complete wall is not necessary. You can either built a complete wall or stylize by building a half wall with a column or number of columns according to your requirement and space. This will provide you more storage space and you can also put decorations on it to make the room look more stylish than ever before. 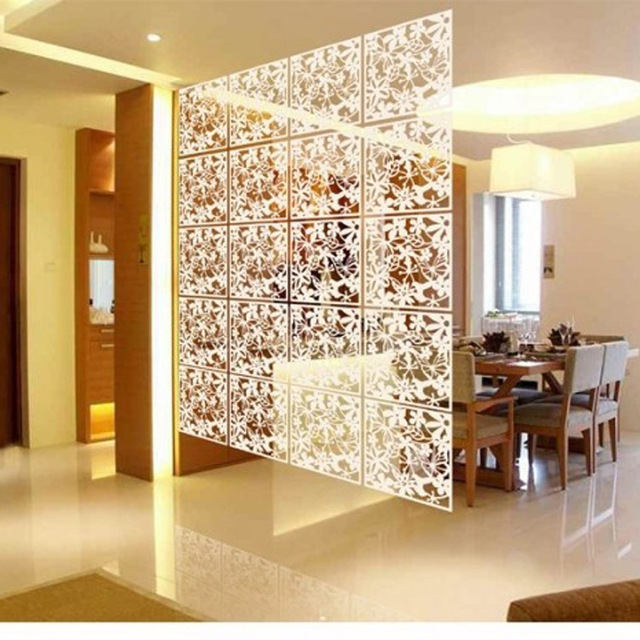 If you are wishing to give your room an artistic designed touch, than that is possible using one of easiest way by adding an Artistic Designed decorative metal partition. Acrylic panels (which are transparent thermoplastic in thin lightweight sheet form) can also be used that will give more colours to the room. If you want a more natural theme for your room you can get laser cut designs in the form of flowers, leaves or trees if you want natural theme for your room. So you can easily customize your room or are according to your theme. Wooden furniture gives most classic look than all other materials. It keeps on giving better looks by the time it gets older. 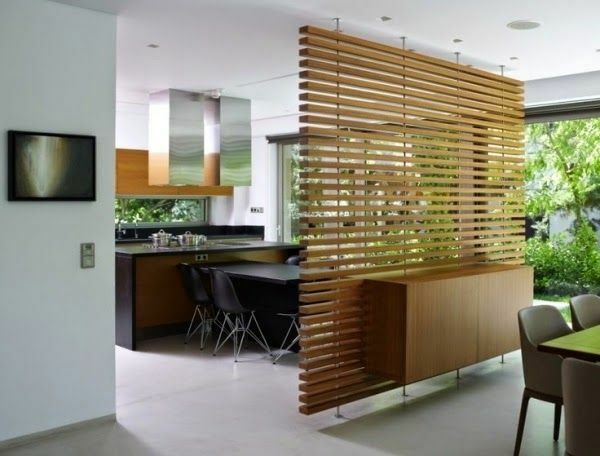 Wooden partitions are also a great option for reasons that they give a rusty look to whole room and highlight most. If you are creative enough and don't bother about sweating than you can make best out of recycled wood by making wooden pallets. 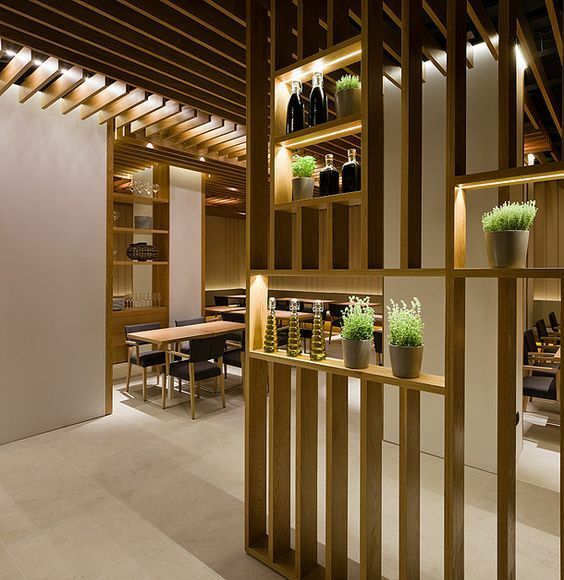 The wooden partition serves as a great piece of decoration and looks very elegant. This will give wall an artistic touch & where you can put your stuff like books, photos and more. This is one of the most commonly used divider. You can install a simple sliding glass door. Glass doors are transparent that make the room look bigger despite the separation. You can customize the colour of sliding and shutter doors which will make room look more dazzling and attractive. Making and installing curtain dividers is such an easy task to perform. You just u need is an ordinary cloth hanger or rolling rack, hang a curtain and put it where you want to put the divider. You can make curtain divider easily at home without many efforts. If you don’t want to use hanger you can do is just cover the wooden frame with fabric or hang hooks on the ceiling to hang a curtain. This is Divider is everyone’s personal favorite and gives a very specious feeling to the room. Creating a secret door with moving bookcases will add a mysterious touch to the room. This is a thrilling and would surprise anyone visiting your home. Imagine someone who visited your home is trying to pick some book from bookcase which is your secret door and at same instant you open the door. It would give a feel of some James bond movie to you and the visitor. This is one of the best ways to save space, which helps you to increase storage and serve the purpose of separating room areas. What you have to is just add a desk to a shelving unit .Now you have nice place to work, keep your books and a also a decorative piece of furniture. For Screen Dividers you have to Attach two- three door together with the help of hinges to make a screen like divider. Or, there is also an easy way; there are many nice screen dividers designs available in the market. On the top of that you can’t go wrong with a screen divider. As they are light, portable, rustic and serve the ultimate purpose.